Sometimes you have an odd little spot in your house that needs a certain something, but you're just not sure what. That's the way it was with the narrow landing at the top of our stairs. That area haunted me for years. Every time I walked up the stairs I'd see that big blank wall and think, "What can I put there?!?!" 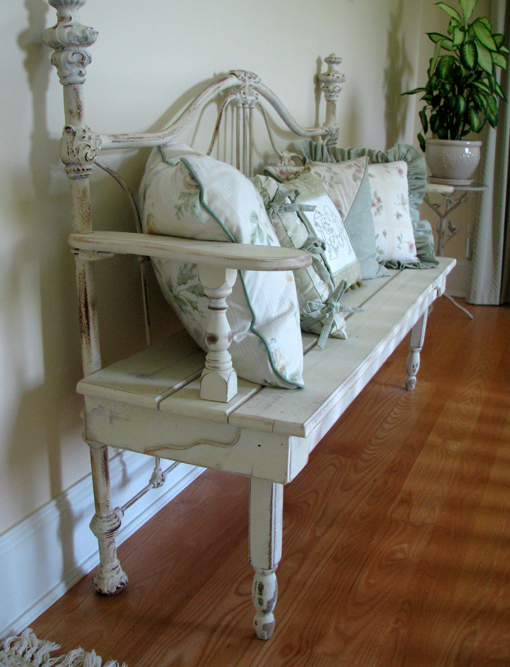 Then one day I got lucky at a local shop and came across a narrow bench that was crafted from an antique bed frame. It was just shallow enough to fit nicely on my landing, and I loved the look of it, with its distressed woodwork and funky, rusty iron frame. 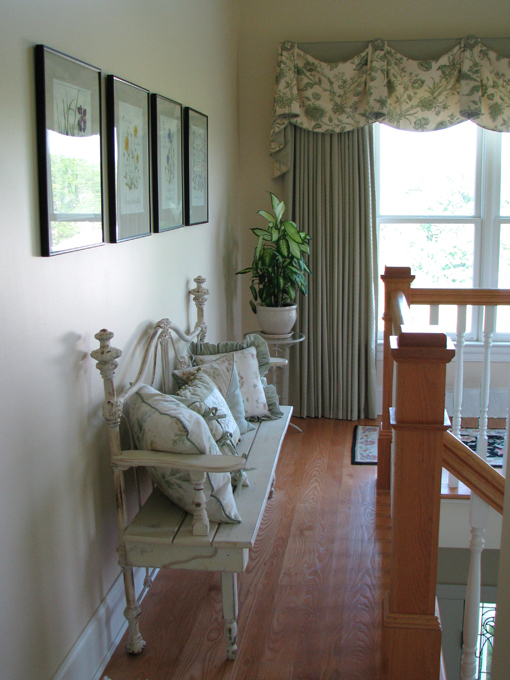 I made some cute pillows to cozy it up a little, and the landing was looking much better, but it still needed something on the wall above the bench. 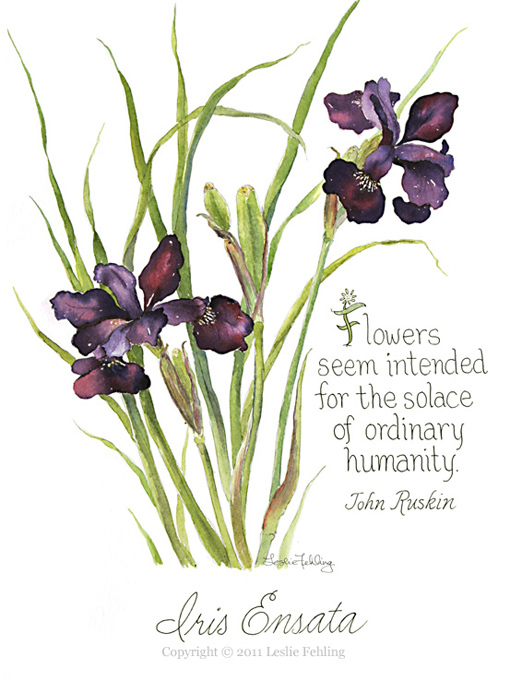 Finally, one day, I had an idea - I'd do a series of botanical paintings! Two rows with four paintings in each row. Eight paintings of flowers that bloom around our home in the summertime. I would fill the wall with flowers! Well, I dove right in and got started by painting the Japanese iris that bloom each spring by my front porch. 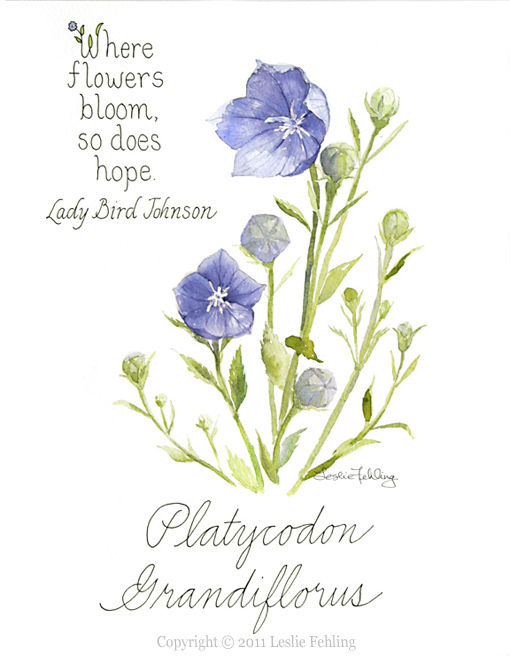 Since I love quotes so much, I decided to include a quote about summertime or flowers in each painting. 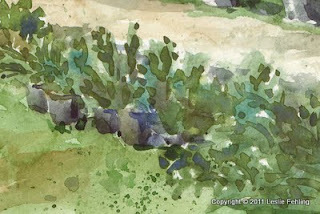 For the second piece in the series, I couldn't resist painting the balloon flowers that grow next to our stone patio. They're so pretty, and that beautiful periwinkle blue color is one of my favorites. I brought these flowers from our old house when we moved to Summerhill in 2000, and they keep multiplying every year. Number three in the series is this painting of the cheery yellow coreopsis that come up every spring by my back steps. 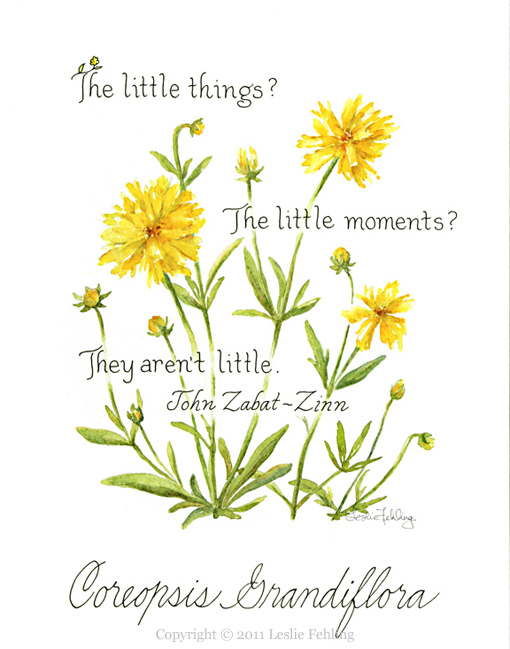 This quote by John Zabat-Zinn is one of my all-time favorites. The last painting I finished that summer was this one of the crown vetch that covers the roadsides here in Pennsylvania and has invaded some of our hay fields. It's not the best thing to have growing in the fields, but as long as it's there, I'm enjoying the pretty pink blossoms. 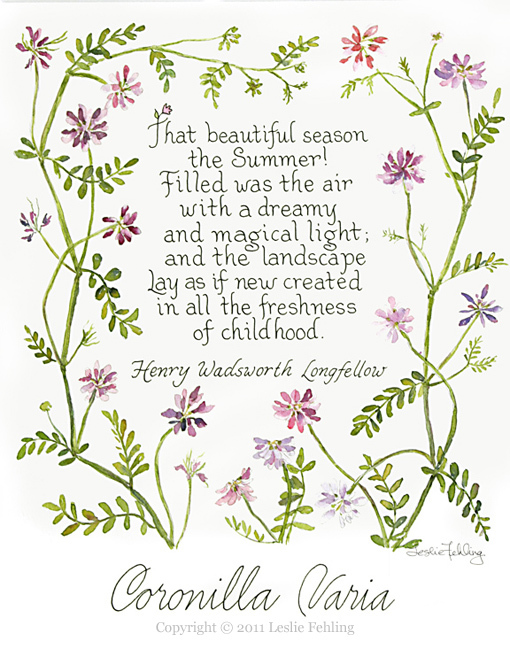 Don't you love the line in this quote about the "dreamy and magical light" of summer? That's the way it is some summer mornings - so dreamy and perfect that you just want to hold onto it and remember that moment when the temperature, the light, the birdsong, the grass, the flowers, and the puffy white clouds in the deep blue sky all come together to say "It's here! Summer is here!" Now you may be wondering where the other four paintings are that I planned to use to "fill my wall with flowers." Well, I kind of petered out at the end of that summer, and the other four paintings haven't even been started yet. I hung the four finished ones above my cute bench and, ever the optimist, left room above them for the others which have yet to be painted. Maybe I'll get to it this summer, maybe not, but I promise that eventually I'll fill that wall, because there are morning glories, roses, hydrangeas, and daisies right outside my door, just begging to be painted. Even when I don't get around to thinking about cooking supper until late afternoon when my tummy starts rumbling, I can still put something delicious on the table in around a half hour. 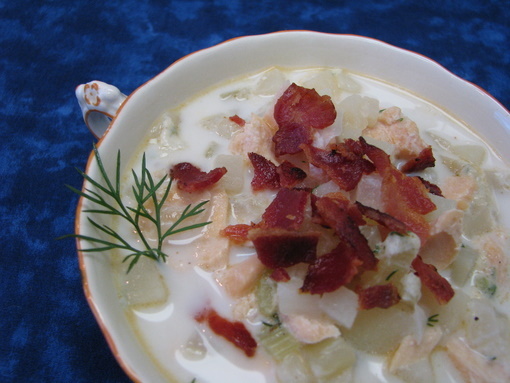 If you're like me and enjoy soup all year long, you might want to give this easy chowder a try. 1. Cook bacon in a 3-qt heavy saucepan over moderate heat, stirring frequently until crisp, then transfer to paper towels to drain. 2. Pour off all but 2 T. fat from pan, then add onion, celery, potatoes, salt, and pepper. Cook, stirring occasionally, until onion is softened, 5 to 7 minutes. 3. Stir in water and bring to a boil, then reduce heat and simmer, covered, until potatoes are almost tender, about 10 minutes. 4. Add milk and dill. Simmer, uncovered, until potatoes are tender, 4 to 5 minutes. 5. Stir in salmon and butter. Simmer gently until salmon is heated through, 2 to 3 minutes. 6. Serve sprinkled with bacon. - If you really love salmon, add an extra can. - Do not mix the bacon into the soup while cooking, as it will get soft and soggy. 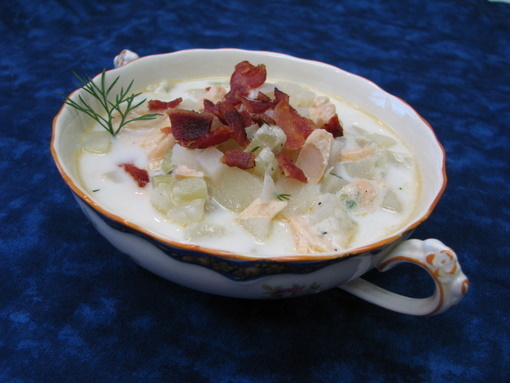 - This soup is great for leftovers, but be sure to keep the bacon separate until serving. - This chowder does not freeze well. - This recipe is naturally gluten-free. The only ingredient that would need to be double-checked is the bacon, but most of the major brands are GF. Everything's blooming and growing this time of year - it’s so exciting and inspiring! It definitely gets me in the mood to paint, but since I don’t have the luxury of long uninterrupted hours to devote to my art, I sometimes have to get creative in figuring out ways to get something down on paper in a short time. 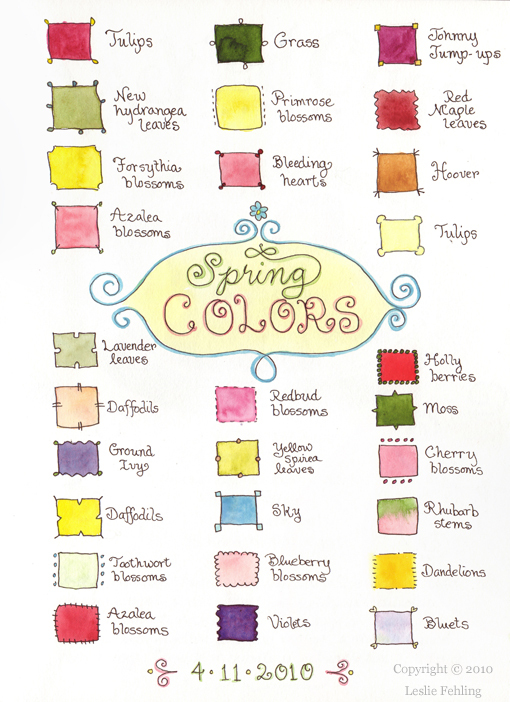 Here’s what I came up with last spring when I wanted to note all the wonderful colors of the flowers blooming in our yard and in the fields around the house. I had fun making each one of the little squares different. It makes it much more interesting than if they were all plain squares, don't you think? There are few non-flower items in the sketch, too. Are you wondering what a “Hoover” is? I enjoy using different kinds of layouts in my sketchbooks. For something simple like this, you don’t even have to able to draw! It’s more of a doodle than a sketch, but it takes me back to a happy spring day when I took a few minutes to appreciate those little gifts from God that are right in front of me. I hosted an event here at my house last week, and these Banana Cupcakes with Peanut Butter Frosting were the hit of the evening. I had made chocolate cupcakes with chocolate frosting, too, but they sat there, totally neglected, while everyone scooped up the banana ones. Since I had lots of requests for the recipe, I figured it was definitely blog-worthy! The recipe is from my Aunt Marie, and it's been a family favorite for years. What a tasty way to use up ripe bananas! It's really easy to throw together and turns out perfectly every time. I think it's great even without frosting, like a lighter version of banana bread. Beat shortening and butter in bowl. Add sugar and beat until light and fluffy. Add bananas and mix well to mash them. Combine flour, baking powder, baking soda and salt. Add flour mixture alternately with buttermilk, mixing well after each addition. OR bake in cupcake papers for about 20 minutes. Cool 10 min. Remove from pans. 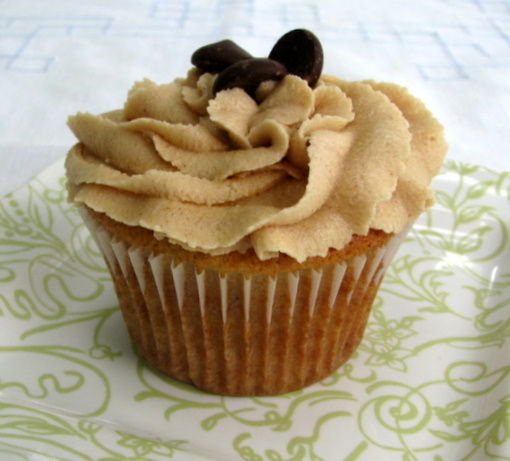 Frost with peanut butter frosting. Place the butter and peanut butter into a medium bowl, and beat with electric mixer until combined. Add confectioners’ sugar alternately with the milk until the consistency is creamy and smooth. Beat for a few minutes to make it light and fluffy. - Try not to eat too many cupcakes - they're irresistible!- The cake and cupcakes freeze well. 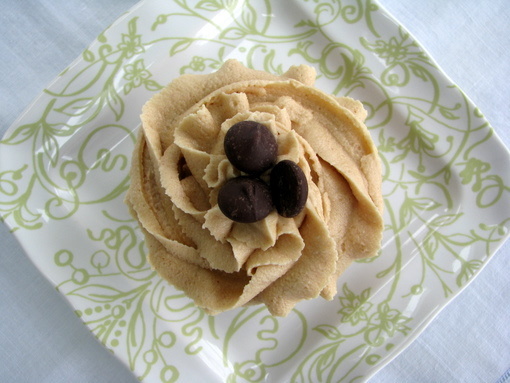 - Chocolate frosting is a great alternative to the peanut butter. - I use Jules Gluten Free flour for almost all of my baking. In this recipe (and in most others) it subsitutes for wheat flour with no other recipe modifications necessary. It makes life a whole lot easier (and tastier!) for people with celiac disease or gluten intolerance. Doesn't it just make you want to go out and buy some begonias or plant some petunias? 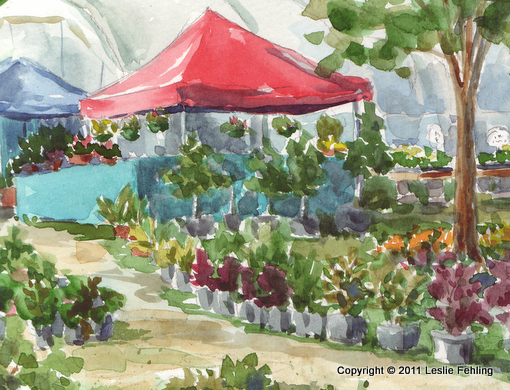 While I was sitting there painting, I was struck by what a happy place a nursery or garden center is in the spring. Everyone has a smile on their face and seems to have high hopes that this will be the best year ever for their garden. Or maybe it's just that they're feeling as euphoric as I am that winter is finally over and the world is green and lush and filled with warm sunny days again. 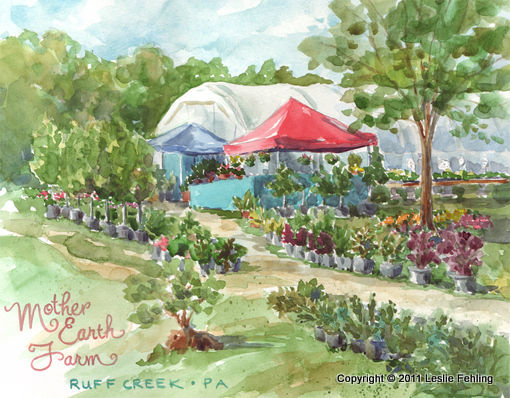 If you're lucky enough to live within driving distance of Ruff Creek, PA, treat yourself to a visit to Mother Earth Farm this spring. I guarantee you'll love it! I had a chance to go out sketching last weekend. It was a gorgeous spring day, and it felt so good to wander along winding country roads with the windows rolled down down, smelling the freshly mown grass and listening to the sound of birds who seemed as excited as I was that the warm weather had finally arrived. 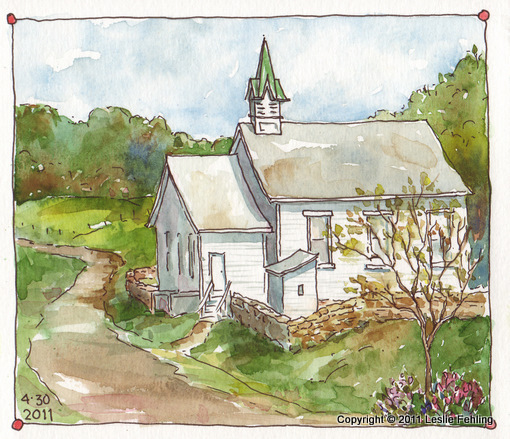 Driving through Lippencott, I stopped to paint this country church with its perky green steeple and walled churchyard. What really made me pull out my brushes though, was the unique structure sitting in the corner of that churchyard - I can only hope that it's no longer being used for its original purpose, now that the church has indoor plumbing! Campaign signs and political posters! 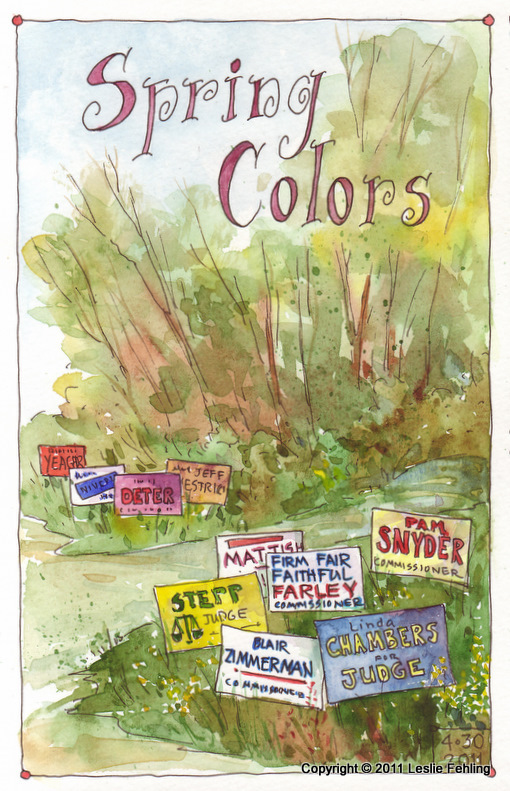 The election's two weeks away, and these "signs of spring" will be gone before the daisies bloom. Ah, summer's on its way!